As an integral part of cellular behavior, cells are sensitive to matrix rigidity, local geometry and stress or strain applied by external factors . In recent years, it has been established that an extensive network of protein assembly couples the cytoskeleton to the nucleus  (reviewed in ) and that condensation forces of the chromatin balance cytoskeletal forces resulting in a prestressed nuclear organization . 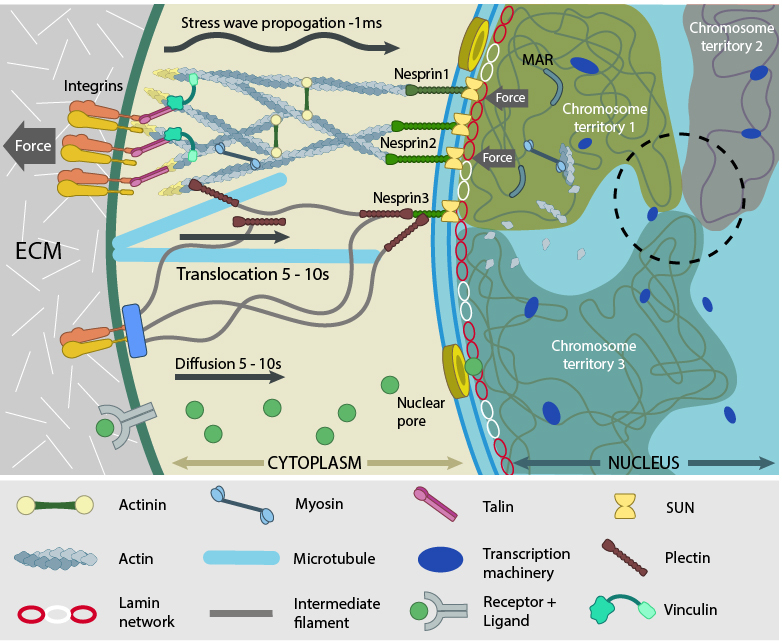 Hence, besides remodeling cytoskeletal filaments, the forces generated within the cell and that experienced at distant cell surface sites converge to the nucleus. This can happen either by physical transmission along the linked cytoskeleton  (reviewed in ) or by chemical signaling, where transcription regulators get transported to the nucleus upon activation  (reviewed in ). These mechanosignals have a significant impact on the mechanical properties of the nucleus such as shape and rigidity (reviewed in  ) through modification of the scaffolding proteins at the nuclear envelope and interior. The double-membrane envelope, the non-random organization of chromatin and the nuclear scaffold proteins, all contribute to the rigidity of the nucleus  (reviewed in ). Nevertheless, its shape and size vary considerably between different cell types and organisms. Various tensile and compressive elements modulate the nuclear envelope, ultimately dictating the overall nuclear size, rigidity and morphology. For example, change in cell size also affects nuclear size in most differentiated cells. Maintenance of a certain volume ratio between the cell and nucleus (karyoplasmic ratio) is critical for transcription regulation . With the cytoskeleton providing an outward pull and chromatin compaction providing an inward force, the nucleus can be envisioned as an elastic structure maintained in a stretched state due to force balance. Any perturbation to this homeostasis causes disorder in the system due to shrinkage or bulging of the nucleus, thus impairing its functional landscape. DNA processing and gene expression programs are affected due to alterations in cytoskeleton, nucleoskeleton and genome compaction   (reviewed in ). 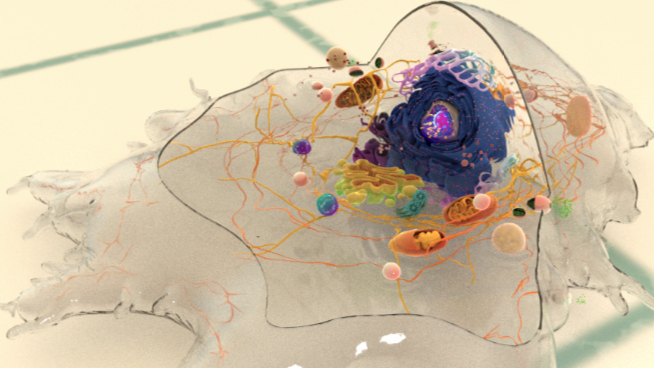 In other words, the nucleus can be regarded as a load bearing organelle that can physically transmit mechanical cues  and a plethora of cellular traits, such as shape, motility, differentiation and development.